Google had a busy first quarter in 2019. Let’s ignore any financial transactions, mergers, or acquisitions. Google said or did some pretty exciting things in Q1. A March 8 Forrester report about Wikipedia quantifies lost traffic the site suffered due to Google’s introduction of Featured Snippets. While they often hold the lucrative “position zero” that snippets represent, they lost over 20% of their search traffic. Will this giant go the way of the hardcover encyclopedias it replaced? Google rolled out some nifty features like “your related activity” and is testing other features like post content for local listings. Also noteworthy, a “Get in Line” functionality integrated into local listings with partnerships with folks like DineTime and OpenTable. Reserve your table right from the Google listing! Google is continually tweaking the secret sauce. Typically, like trying to see the wind, we get indications only based on the changes we can see. SEMRush uses a “sensor” to measure the volatility of search results. As algorithm changes are made, pages ranking in Google’s Search Engine Results Pages (SERP) fluctuate. With greater occurrence of this shuffling, we can infer a change has been made. They noted “very high” volatility on Jan 9, Feb 21, Feb 27, Mar 3, and Mar 13 on US databases. SEMRush recorded about 230 sensor events registering High or Very High on various desktop or mobile databases globally between January 1st and March 22nd. Moz uses MozCast. MozCast lists two unconfirmed updates on Feb 6 and Mar 1. Presumably, folks that are asking are talking about the rarely announced confirmed updates which are broad core search algorithm changes. One such confirmed update happened on March 12. As with recent broad core updates, if your site’s rankings tanked, Google’s answer is “there is no fix to what happened.” It’s officially called the March 2019 Core Update – not as catchy as Panda or Medic. Speaking of Medic (Aug 1, 2018), Google has said the March 2019 update had no specific target at medical or health sites. So what do we know about this confirmed update? Not much. There’s more speculation than confirmed data. Some have speculated it is a reversal of the Aug 1 “Medic” updated, others that this is Penguin-related (another previous major core updated). Others think this was the biggest update in history, or that it introduced “neural matching.” All of this speculation has been myth-busted. Analysis by experts Barry Schwartz and Glenn Gabe is thus far not conclusive. The overall assessment is generally to look holistically at your site to make it better. This “announcement” almost qualifies as a non-news item. Google hasn’t supported pagination markup for years. Recent discussions made a big splash in a “sky-is-falling” sort of way. Lots of folks thought that this was a recent deprecation of support. …you need to make sure the paginated pages can kind of stand on their own. While Google says “keep doing what you’re doing,” our recommendation is the practice annoys your readers. While you don’t need to remove old pagination, don’t continue the method if you use it. Google’s first-quarter news has a lot to do with Google Search Console. This long and major overhaul means many legacy features of Search Console are no longer available after March 28, 2019. While not all of the old features will port over from the legacy version of Search console, new features are being tested and rolled out. For example, integration with Yoast to add live indexing for Bing and Google. Other new features like domain property verification and allowing the removal of XML site maps breathe life into previously neglected areas. Some of the new features are triggering new warnings, many of which stem from the integration of the structured data testing tool. The new features aren’t without bugs. We’re getting client questions about errors and warnings that are often erroneous. Not to worry. In most cases, clicking “validate fix” is all you need to do. However, it never hurts to make sure that’s the case. Be warned, some of the new Search Console notifications you’re getting sound scary, like this one. The new addition of “Products” on Google Search Console is also tripping new warnings. Mostly, this upgrade reveals opportunities to use (or better use) Structured Data Markup. In one client’s case, they were getting warning messages about optional structured data that was missing. What does structured data markup mean for you? Essentially, it lets search engines understand the characteristics of a page or product. One benefit: this allows Google to feature your products better if you choose to advertise using Google Merchant. Structured data markup helps in organic search too. Some structured data ends up populating things like Sidebar “Knowledge Graphs,” review stars, deals, and more. Some of the new Search Console features are so new (last month or so) that they’ve got “beta test” warnings if you drill down on (in this case) the individual products. Occasionally, you’ll discover warnings like “Missing field description” that even prove factually inaccurate. For one client, we validated the do-nothing “fix” and prompted Google to re-crawl. 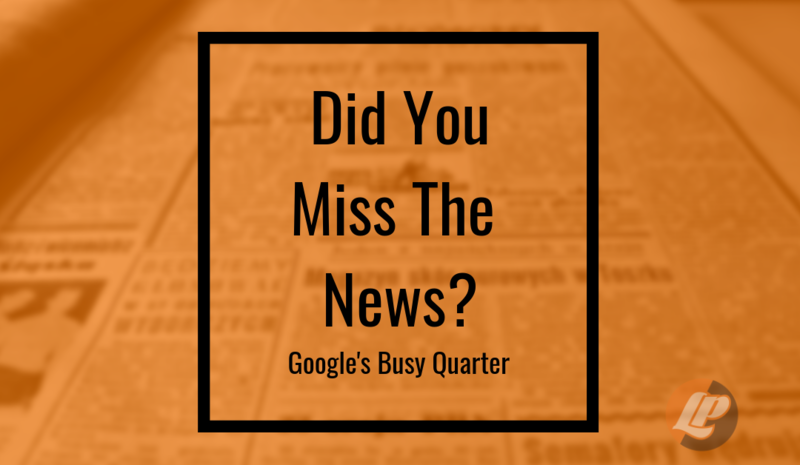 Want to stay up to date on all the latest Google news as we do? Barry Schwartz does a fantastic job over at Search Engine Round Table.